Nick, an ordinary man who can transform into superhero Captain Rainbow, and who stars in his own TV show. 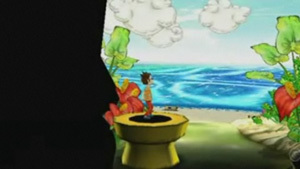 When Captain Rainbow's TV show is no longer popular, Nick travels to Mimin Island, where wishes are said to come true. The island is populated by rabbit-like creatures called Mimin, plus a cast of forgotten Nintendo characters, each hoping to have their wishes come true. 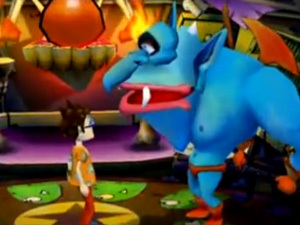 Nick can try to help the other characters achieve their wishes. Successully completing their challenges will earn you Kirarin crystals, and when you collect 20, Nick has to carry a star to an altar while being chased by Shadows. Nick can then either grant his own wish or that of one of the islanders. 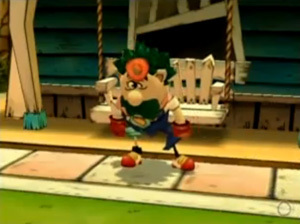 Mimin Island is populated by old, forgotten Nintendo characters, many of them groteque parodies. From Dokidoki Panic, Super Mario Bros. 2 and other Mario games. Birdo's wish is to be popular with all the boys, but she is arrested when Mappo, uncertain of her gender, catches her going into a women's bathroom. 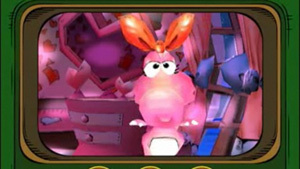 Nick has to collect a mysterious vibrating object from Birdo's house to "prove" that Birdo is female. The confusion over Birdo's gender dates back to the instruction manual for Super Mario Bros. 2, where it was said Birdo was a boy who wishes it was a girl. 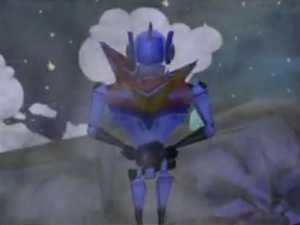 A robot policeman from Giftpia, a GameCube game by Captain Rainbow developer Skip. Mappo's wish is to become a plain-clothes officer. He lives with Tao in the guardstation. 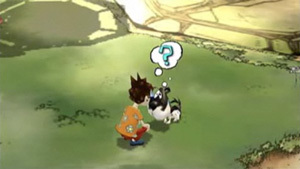 A regular character in Skip games, based on director Kenichi Nishi's actual dog. 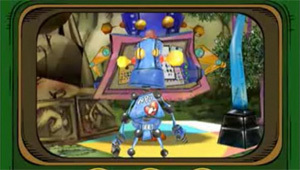 He has appeared in Giftpia and Chibi-Robo! plus appearances dating back to Nishi's former company Love-de-Lic's 1997 game Moon: Remix RPG Adventure. Tao lives with Mappo in the guardhouse and wishes that he could do nothing but eat. A superhero action figure from Chibi-Robo! 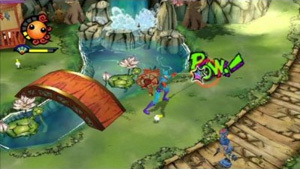 He crashlands on Mimin island when his spaceship is hit by a meteor. From Mike Tyson's Punch-Out!! on the NES. 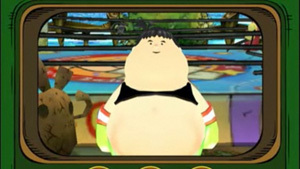 Mac has become lazy and overweight, and wishes to train up in order to become World Boxing Champion again. The heroine from Famicom Fairytales: Shin Onigashima. 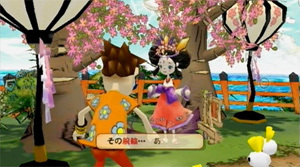 She becomes good friends with Nick and lives in a Japanese shrine. 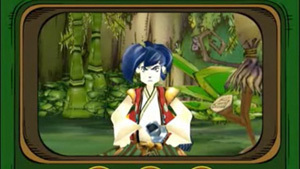 The samurai hero of Mysterious Murasame Castle. He wishes to become strong with the sword, but before he can do that he has to learn to control his terrible nosebleeds. The player character in Golf on the NES (who for many years has been mistaken for Mario). 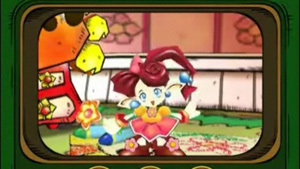 The fairy hero of Panel de Pon. She wishes to be a great magician. She lives in a large mushroom house. 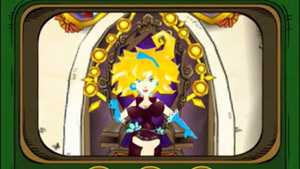 A seductive woman with wild hair who appeared as a minor character in The Legend of Zelda: Link's Awakening. Her wish is to enslave all the men in the world. 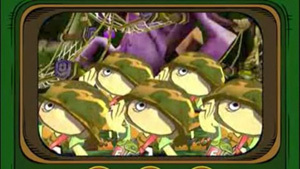 A squad of soldiers from Famicom Wars. Their wish is to become the best volleyball team. The villain from Devil World. His wish is to become the number one villain in the underworld. There are several Warp Pipes from the Mario series on the island that take Nick to out-of-reach places. They even make the same sound as in the Mario games. 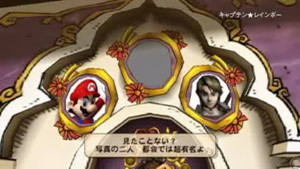 Above her chair, Tracy has artwork of Mario (Mario series) and Link (The Legend of Zelda series). There is an empty portrait above them. 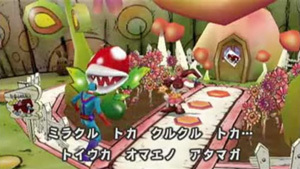 In Lip's garden is a Piranha Plant from the Mario series. When Nick goes fishing, among the fish he can catch are the Cheep Cheep and Blooper from the Mario series.